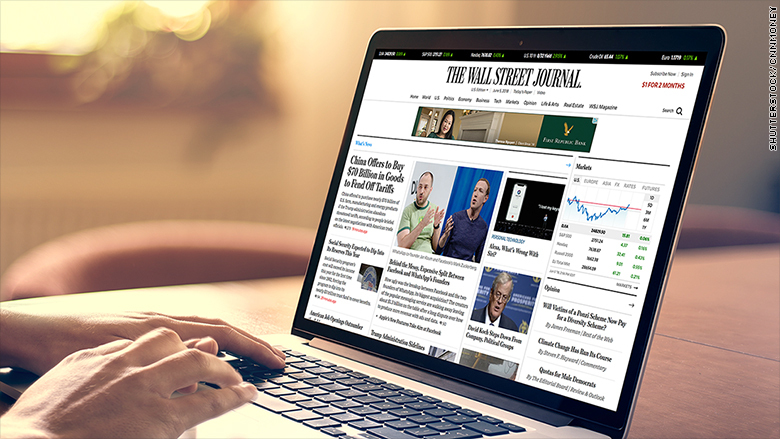 Wall Street Journal editor-in-chief Gerry Baker is stepping down from his post to become editor-at-large, News Corp announced Tuesday afternoon. Baker will be replaced by Matt Murray, the paper's current executive editor. Baker served as editor-in-chief for just over five years, and was previously deputy editor. In his new role, Baker will now write a column and host the paper's conferences. He will also now host a Wall Street Journal-branded news and interview show on Fox Business Network, which shares an owner with the Journal, Rupert Murdoch. "It has been an extraordinary opportunity to have led the world's greatest and most trusted news organization. I'm enormously grateful to Rupert, Lachlan and Robert for entrusting me with the Journal's mission and it has been an unsurpassed privilege to have worked with so many talented and dedicated colleagues," Baker said, referring to the Murdoch family, which controls News Corp.
Baker joined the Journal in 2009 from the Times of London. Rumors about Baker stepping down have flown around the Wall Street Journal's newsroom for months according to multiple staffers who spoke to CNNMoney on the condition of anonymity. In October, Vanity Fair speculated his days were "numbered." Baker has come under criticism both internally and externally over his treatment of President Donald Trump. In a town hall with the Journal staff last year, Baker pushed back on internal criticism that the paper had been too soft on the president, calling it "fake news." Last year the New York Times reported on a series of emails Baker sent to a group of Journal reporters and editors, blasting them for their coverage of a Trump rally as "commentary dressed up as news reporting." In August, Politico published the transcript of a Trump interview Baker led along with a group of reporters and editor in the Oval Office. During the interview Baker talked about seeing Ivanka Trump at a party and chit-chatted with Trump about golf. Trump also praised Baker for an editorial the paper ran, though Baker pointed out that the paper's opinion section stands apart from the news division. Having an editor-in-chief conduct a presidential interview is considered an unusual move at a newspaper, where such interviews are usually led by White House reporters and editors. During the interview, Trump claimed that the leader of the Boy Scouts of America called him to say that a speech he had given to the organization was "the greatest speech ever made to them." But the Journal did not initially report on the comment, which following Politico's publication of the transcript the Boy Scouts said was not true. Murray will be the fourth editor-in-chief of the paper since the Murdoch's News Corp. took over the paper in 2007. He's been with the company since 1994, rising through the ranks from reporter to deputy managing editor and deputy editor-in-chief. Murray will formally take over on June 11. In a statement, Murray said he is "honored" to have been appointed editor-in-chief, and praised the staff of the Journal as "the most trusted source of news and information." "There is little doubt that at a time when journalism faces a host of challenges, readers are hungry for sophisticated, fair, illuminating and fact-based journalism--and see us as a uniquely trusted news source," he said. Robert Thomson, CEO of News Corp, praised Baker in a statement and called Murray "a leader of the highest commitment and integrity." "His strong reporting and editing background and his passion for the Journal are obvious to all who have the privilege of working with him," Thomson said of Murray.